Due to its relatively unexplored and wild nature, the central Pyrenees are home to a wide variety of rare and interesting birds and animals. The brown bear is the most talked about animal in the Pyrenees. Until the early 20th century there was a healthy population of brown bears in the Pyrenees. 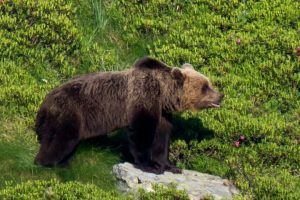 However, in the course of that century, the population dwindled until, in 1996, 3 Slovenian brown bears were reintroduced into the Pyrenean mountain forests in an effort to boost the population. This was a controversial move as farmers whose herds of sheep and cattle roamed the high mountain pastures complained that their flocks would be attacked and destroyed by this big brown predator! The slogan ‘Non aux ours’ (‘No to the bear’) started to appear in spray paint on roads and walls as public feeling grew. But despite all this, the bears are actually very private, shy animals and there is now a healthy population of around 40 bears living in the forests and on the mountainsides of the central Pyrenees. We are privileged to be working closely with both the French and Spanish bear experts to offer people the rare opportunity to track and potentially see these elusive creatures in their natural habitat. It’s an unforgettable experience! 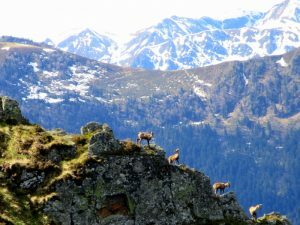 The Pyrenean chamois, known locally as the isard, is a species of goat-antelope which can be found in the mountains up to an altitude of 3000m. It is a small animal reaching an average height of just under a metre at the shoulder. You can easily identify the chamois from their backward curving horns that appear on both males and females. Their coat is typically reddish brown during the summer and turns a brownish black in the winter with dark patches around the eyes. It is an incredibly agile animal, negotiating scree slopes and steep mountain terrain with ease! Our local guides know the specific areas that are frequented by the chamois. A good hike is usually involved, but the effort is worth it to see these amazing animals in their natural environment. The red deer is one of the most common animals that you will see in the foothills and mountains of the Pyrenees. It’s not unusual to be driving through the foothills and spot a herd of red deer on the edge of woodland near the road. They are prolific breeders and their numbers are kept in check by hunting which is permitted from August through to February. 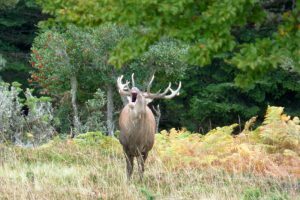 From mid September to mid October, the woodlands of the Pyrenees foothills resound to the unmistakable bellow of the red deer stags. This is the rutting season, known as the ‘brame des cerfs’ in French, when the stags seek to gain new territory and mate with as many hinds as possible. Thanks to the local guides who know the best areas for it, wildlife enthusiasts can get incredibly close to this testosterone-fuelled event and enjoy some incredible photographic opportunities. It really is a spine-tingling experience! The Egyptian vulture is an unmistakable raptor with its white plumage and black trailing wing edges. It’s the smallest vulture that we have in the Pyrenees but is still an impressive bird with its wingspan of almost 2 metres. It’s known as a ‘percnoptère’ in French from its Latin name Vultur percnopterus. Like all raptors, it feeds on carrion and dead animals in exposed places. But it also catches and kills small animals such as rabbits if it has the opportunity. 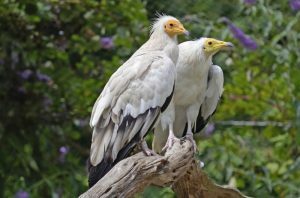 The Pyrenees are home to close to 100 territorial pairs and maybe surprisingly, the Egyptian vulture’s habitat is not confined to the mountains. We are fortunate to have a breeding pair in the craggy woodland that surrounds the Adventure Creators’ base in the foothills of the Pyrenees. Spotting them as they circle overhead is always a thrill. Egyptian vultures migrate south to Africa in winter. It’s a spectacular and unmistakable sight with its rusty red plumage and unmistakable lozenge-shaped tail. One of the most endangered raptors in Europe it is also considered to be the largest raptor in Europe thanks to its 3m wingspan. However, we are lucky enough to have seen this beautiful bird in our part of the central French Pyrenees on a couple of occasions which bodes well for the future. 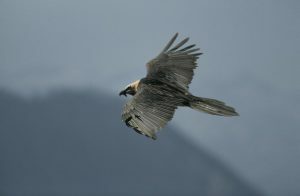 The Lammergeier is one of the most useful raptors to have around. 80% of the its food is composed of bones, feet, tendons and ligaments from the carcasses of wild and domestic hooved animals which it can ingest thanks to its powerful digestive juices. The bearded vulture is nature’s best cleaner-upper!